SEDONA – (November 29, 2018) – The Rotary Club of Sedona Red Rocks recently awarded a grant for thirteen new child car seats to Sedona Fire District. The club provided the car seats through a District Matched grant to the fire district to ensure that the needs of the community are met. “Proper use of safety seats have been shown to significantly decrease child injuries and fatalities if a collision occurs” said Eric Walter, Community Integrated Paramedic and National Child Passenger Safety Technician. As a Rotary group we felt this helps further the safety of our community and children. “Through grants like this one, the fire district is able to ensure local families in need have access to car seats” stated Kris Kazian Fire Chief and President of the Rotary Club of Sedona Red Rocks. 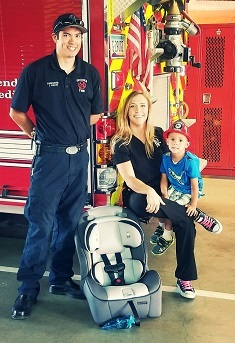 We would like to remind everyone that specially trained car seat technicians at fire departments near you are happy to look over any car seat and make sure it is installed properly and in Sedona if you need a new one, we have one for you.